Insert a new GUID by invoking the command under the Edit top-level menu or hit CTRL+K,Space. 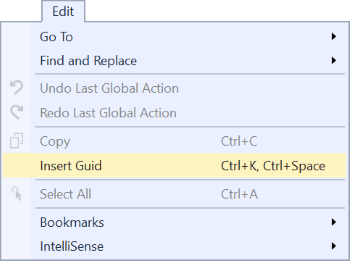 If Visual Studio is unable to insert the GUID, it will be copied to the clipboard so you can easily paste it in manually. When a GUID is copied to the clipboard, a notification will be displayed in the status bar.